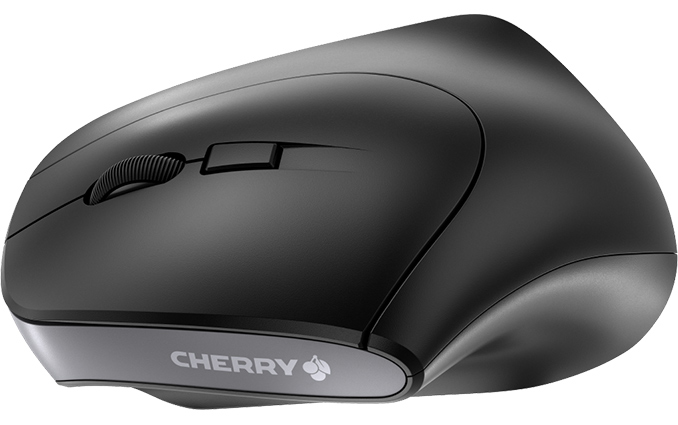 Cherry has introduced its MW 4500 mouse featuring a rather unique shape that promises to reduce, or even prevent hand fatigue, but only for right handers. The mouse is aimed at mainstream users in office or home, it has a sensor with a relatively high DPI sampling rate, is outfitted with six buttons and a scroll wheel. What is particularly noteworthy is that it is not expensive at all. Throughout the last decade anf a half, computer mice have evolved quite greatly as manufacturers experimented with shapes and sensor technologies to provide the best ergonomics and performance for different types of users and applications. The absolute majority of today’s “ergonomic” mice features asymmetric shape along with various design elements to improve the user comfort. The Cherry MW 4500 takes some pages from today’s ergonomic mice, but looks radically different than most of them because its palm rest has an angle of 45°. Such palm rest angle is more common for trackballs rather than mice, but Cherry believes that it “relieves wrist tension and allows fatigue-free work.” Ergonomics is, of course, a very individual thing, but it should be interesting to see how such a radically high angle affects pointing precision when editing images or playing FPS games. The extravagant shape is the key selling point of the Cherry MW 4500, but it does not mean that the manufacturer did not care about other aspects of the product. Inside the Cherry MW 4500, there is an infrared laser sensor that supports 600, 900 and 1200 DPI sampling rates, which is in line with other modern mice for the SOHO market. When it comes to buttons, there are six regular keys found on all modern mice, nothing extraordinary. The mouse is wireless, it comes with a tiny receiver that resembles Logitech’s Unify and needs two AAA batteries to operate. Cherry does not disclose how long the batteries are going to last for an average user, but says there is a status LED that warns the user about a low battery. As for dimensions and weight, the mouse measures 120×60×35 mm and weighs 120 grams. Normally, mice with fancy ergonomics come at a hefty price. This is not the case with the Cherry MW 4500, which will retail for €30, $35, or £30, depending on the region (and at price points like these, it will be interesting to buy the MW 4500 simply out of interest — is it really comfortable to use?). The mouse will be covered by a two-year warranty. Now this looks a much better than the last MC 4900 mouse in terms of ergonomics. 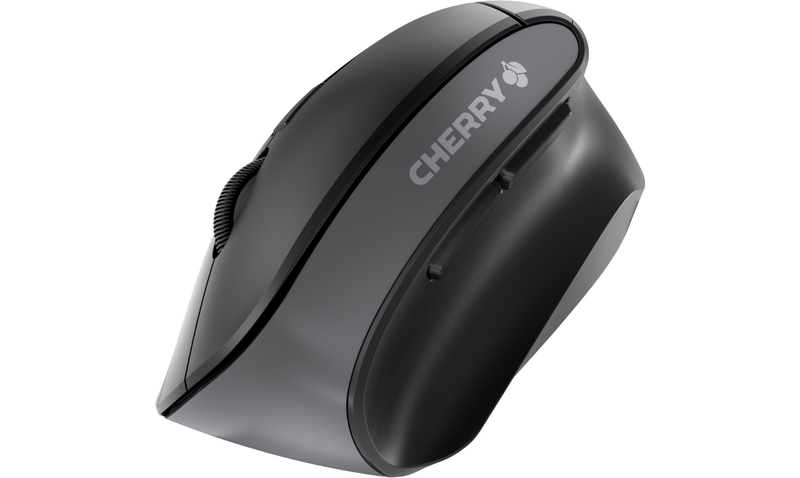 I'm surprised the MC 4900 mouse actually passed through Cherry's rigorous ergonomics testing. If you're referring to the Evoluent mouse I've used them for years and never noticed a push when trying to click. They are solid enough to keep them grounded. I've been using one similar to those that I bought on Amazon (also available on eBay). It is the Delux M618LU Wired Vertical Mouse (https://www.amazon.com/gp/product/B00D19KF7U). I like it a lot and have gotten used to it already. The feel/grip is similar to a pistol grip, which feels natural for point-and-shoot games. It comes with a wrist rest that attaches to the mouse, which I didn't prefer and have removed. It also has a DPI button on top that is easily accessible, and it needs no additional drivers on Win10. No edit, sweet. Product link was incorrect. What are the drivers like? Extremely bloated like Logitech or Razer? Or default only OS drivers like Zowie? I also like driverless mice, and Zowie's been using good, comfortable, no-nonsense mouse shapes with quality sensors for a good while.